No one really wants to get a haircut from an amateur, which is why hairstylist colleges exist. But those stylists have to practice their craft somehow. Usually this involves endless dummy heads and, eventually, the heads of real people. Any mistakes made on either of those are rather irreversible – at least in the moment. Now the Robot Technology Research Group at Tokyo Institute of Technology is developing a virtual reality program to help new hairstylists learn to cut and style hair on virtual models that won’t mind an inexperienced stylist. The system is called Air-Hair, and it consists of a clunky pair of plastic “scissors” with a motor and a number of sensors. 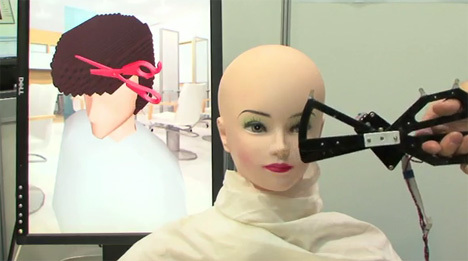 A hairless plastic mannequin head provides a physical representation of a client’s head, but the student has to look at a nearby screen to see her virtual scissors at work. As demonstrated in the above video, the scissors chop away at bits of animated hair while the motor provides a realistic sense of resistance. The system is limited at the moment because it was a student project, but the concept could easily be refined to include other tools and a more realistic interface between trainee and virtual client.